Fusch an der Glocknerstraße is a village in the Pinzgau area of Salzburg. Fusch has a population of approximately 700. As indicated by the name, Fusch is situated at the Großglockner Hochalpenstraße, a panorama road to Austria′s highest mountain. Unlike neighbouring Bruck, which has a namesake in Styria, Fusch emphasises its vicinity to one of Austria′s most popular tourist attractions probably for marketing reasons only. The panorama road was a project to fight unemployment in Austria during the Great Depression of 1929. It was completed in 1935 and was of paramount importance for building up Austria′s reputation as a holiday destination. Fusch is situated in the Fuschertal Valley, which originates at the main mountain ridge of the Alps (Alpenhauptkamm) and extends to the Salzach river valley. The river Fuscher Ache runs through the Fuschertal. This area is very attractive for hiking; in a side-valley of the Fuschertal, you will get to Bad Fusch, an old spa town that was founded around local springs and due to the good air in the 18th century. In the 19th century, Bad Fusch became one of the most exclusive and fashionable spa towns in the Austrian-Hungarian Empire, rival to no lesser than Bad Gastein. After WWI, to town slipped into a recession and by 1945, the last remaining fin de siecle hotel went bust. Following this, most of Bad Fusch decayed and today, it is more or less ruined and destination only for day-trips. The old parish church of Bad Fusch was renovated in the 1990ies. 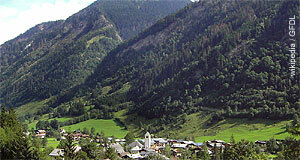 Today, the area is popular for excursions because it is part of the National Park Hohe Tauern. This is also the main reason why Fusch is by no means a skiing town - it is situated within the most strictly protected areas of the national park and all anthropogenic influences are under strict supervision. Tourism is therefore confined to visitors who drive through Fusch on their way to the Großglockner Hochalpenstraße and people who come for hiking.